McLean (population 808) is located on Interstate 55 at the intersection of U.S. Route 136. McLean was at one time one of the many famous stops along the old Route 66 roadway and is home to the Dixie Truckstop. It is located approximately 17 miles southwest of Bloomington in southwestern McLean County. The Union Pacific Railroad runs through the center of town. "The history of the education in McLean dates back to the early 1840's when a school house was built in what is now known as Mount Hope Township (near today's McLean). The building was built of logs and was later moved to McLean around 1857, before another building was built in 1868. High school studies began in 1878 with a two-year program, which later was upgraded to a three-year school in 1882, then a four-year school in 1907. A fire destroyed the grade and high school in October 1917, causing a vote in the village to build separate buildings for both grade and high schoolers. 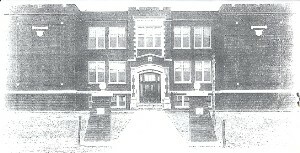 The new buildings debuted in 1920, while a new gym was added in 1950. In 1955, residents in Waynesville closed their schools and sent their children to McLean, forming McLean-Waynesville High School. M-W would remain in session in the McLean HS building until the spring of 1968, at which time Armington came into the fold for the next four years (1972). At that time, McLean, Waynesville, and Armington along with five other communities (Atlanta, Danvers, Hopedale, Minier, and Stanford) officially banded together to open the present-day Olympia HS in rural Stanford, as the result of a November 1966 vote. The majority of the McLean HS building was demolished in the spring of 1980." McLean houses a grade school that serves the Olympia District for McLean, Waynesville, and the southern portion of the district. Most of the original McLean High School building was razed to make room for a newer McLean-Waynesville Grade School building, which was constructed in 1980-81. 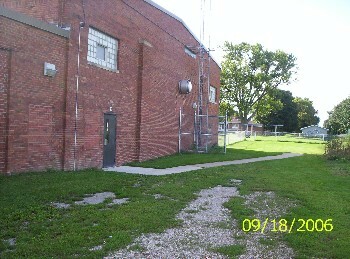 The grade achool kept just the original McLean gymnasium for its use. For we know you have sand, McLean High! Victory from you McLean High! Like men of old, on giants. For honest Labor and for Learning we stand. Dear Alma Mater, McLean HIGH! Of our dear old high school...rah! rah! And we're all out for M-W High. McLean High School definitely offered basketball, baseball, and track for boys. IHSA hardware was earned in these sports. McLean also offered football for a time prior to 1930 (see story below). As McLean-Waynesville-Armington, the school also gave students to participate in wrestling and cross-country. The accomplishments of the athletes from the school are listed below. 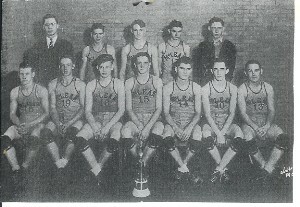 McLean High School basketball won three District Titles in its heyday. These years are listed below. With the help of the folks at the Mount Hope-Funks Grove Library in McLean, we have been able to find the win-loss records and coaches' names from teams, thanks in part to their listing of yearbooks from the school. In some years, we are still in need of finding out more information. If you have that information, please contact us at the addresses listed below. The boys track team had one great athlete bring home IHSA hardware. His name was Paul McFarland. "Big Mac" brought home 4 medals, including three in 1913. His effort resulted in the McLean High School Track Team placing 4th in this year. Great job and congrats to the McLean thinclads. The finals of 1913 are listed below...what a great accomplishment for the kids of McLean High! 1913 Team Finished 4th Overall !! "Paul McFarland was coach and principal at McLean High School from 1930-1946 (this may be incorrect as proven by the football photo). While at college at Illinois Wesleyan, he played football, basketball, baseball and threw the hammer (threw out his back). At one point he held the county record for the hammer throw. He started his teaching career in 1917. He spent one year in the service serving in W.W. I. Mr. McFarland excelled in science and math besides being principal and coach. He also had a degree from the University of Illinois. He had a great influence on all his students. He retired from teaching in 1946. He and his wife moved to Seattle, Washington to be closer to their daughter. Mr. McFarland passed away in 1954." Great find by Doug Davis! As you can see in the photo to your right, baseball was definitely a sport at McLean High School. The Colts would play the majority in the fall and were known to pick up a few games in the spring before deciding to switch the sport to spring full-time sometime in the 1960's. The Colts of 1952 ended their season at 7-1 finishing in a three-way tie for first place in the Kickapoo Conference! ("Right click" on the photo to enlarge and read a summary of the Colts' season). Thank you to Doug Davis for contributing the baseball photo to this page! "I recently ran across some great photos and information regarding McLean High School. I had the opportunity to view a centennial book put together in 1955 for the 100 year anniversary of McLean. In it were some great photos and historical information about the school and it’s early 1900’s sports teams, including a rare photo of a football squad. I know that as a kid my grandfather had mentioned playing football for McLean in the 1930’s. The story is told that a new principal was hired and did not believe in football and burned all the equipment. The photo that I saw is from 1924 and has a photo of a “MacFarland” who you refer to as a track star during that era. Kenneth Moreland (who was a teacher, coach, and administrator) who I have heard of but do not know compiled the information for the centennial book and he did a fantastic job." "Having just heard about your web site, I looked up McLean high school. I was a math and science teacher for 2 years at McLean High School (Fall of 1952-Spring of 1954). Part of your commentary says that they may have had a baseball team. There indeed was a baseball team at McLean High. 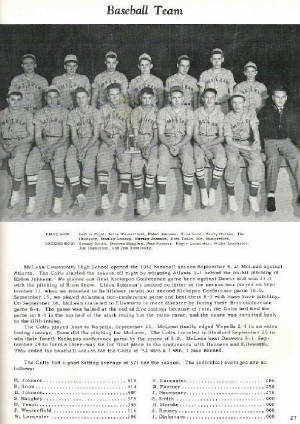 Pictures of the teams are available in the 1953 and 1954 yearbooks. I have pleasant memories of teaching there.